“Life is a journey, not a destination”, Ralph Waldo Emerson. 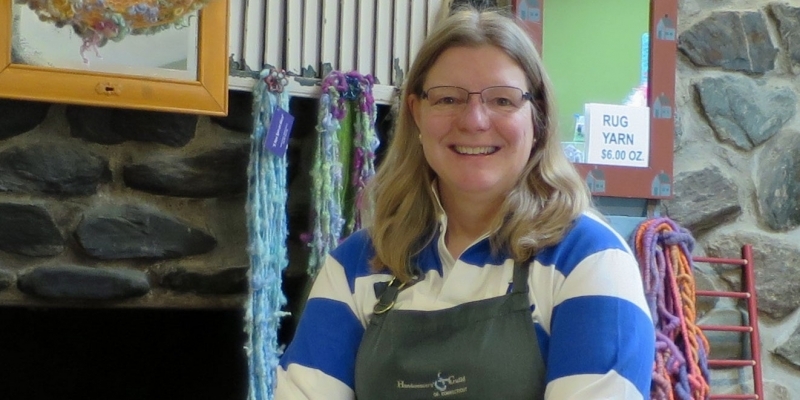 Building awareness and interest in the fiber arts is a passion at Mad River Fiber Arts & Mill. Susan Snider can’t remember a time when she didn’t love the fiber arts. Her passion for all things fiber started as a young girl when she was taught to sew by her grandmother. Living a year in Sweden as a Rotary Exchange Student and exposed to handweaving and spinning, Susan was hooked and her love for both continues to this day over 40 years later. Born and raised in New Jersey, Susan graduated college with a BA in Accounting and MBA in Finance. Her business career started in New York City initially working for a tugboat company, where she was reportedly the first tugboat saleswoman in the country. This led to a 25 year career in the maritime industry in a variety of positions including paymaster, operations manager and Vice President Operations and Sales. All the while weaving and spinning remained an important part of her life and in 1990 after moving to Connecticut, Susan joined the Handweavers’ Guild of Connecticut. This active group expanded Susan’s horizons and as we say she fell down the rabbit hole and fiber arts became an obsession. By this time, Susan was purchasing raw fleeces, processing and dying them by hand and teaching workshops in weaving and spinning. A life-long Mad River Glen skier, Susan moved to Vermont permanently in 2012. Unpacking the boxes of raw fleeces it soon became clear that she would never be able to process them all in her kitchen sink in her lifetime. Contacting various mini mills to process her fiber revealed a huge backlog of over eight months and up to two years. 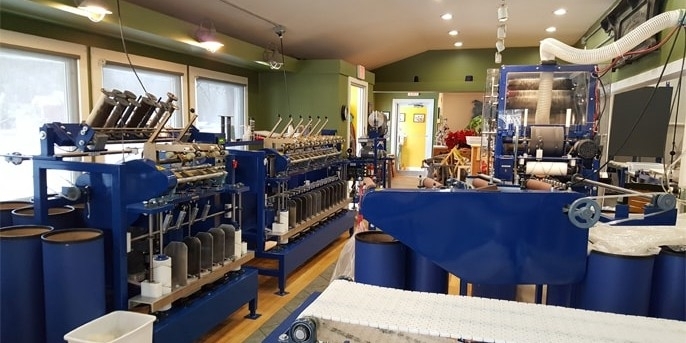 And that’s when the idea struck to explore the possibility of opening a fiber processing mini mill in Waitsfield, VT.
That was in October 2015 and by October 2016 Mad River Fiber Arts & Mill opened for business. Susan is passionate about building community around the fiber arts. Mad River Fiber Arts & Mill not only processes custom work but sources local Vermont wool for its own products. In the bright and colorful retail space we hold workshops in weaving, spinning and felting. Susan welcomes you to visit and hang out a while. We also have our own line of yarn and fiber products made from 100% Vermont wool, alpaca and mohair. Our colorful and vibrant hand dyed products are like a candy store for the fiber lover. Stop by our retail shop and hang out for a while.